Cigar storage is tricky to master but it can be even more challenging to decide and commit on a particular type of storage. Fortunately, we’ve covered this in a variety of different humidor guides. You can use the links above to jump ahead. You can also head to the menu below to see what else is covered as well as our other guides. What Are The Best Humidors You Can Buy Online? 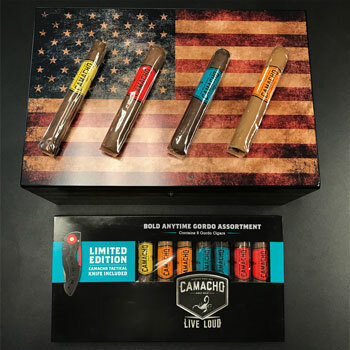 Out of all the humidors that we’ve owned and tested, the Quality Importers Old Glory humidor is a gift that keeps on giving. After years of use, it continues to perform with an excellent seal and low moisture exchange. We’re very fond of the attractive weathered US flag and the kiln-dried Spanish cedar lining performs well. 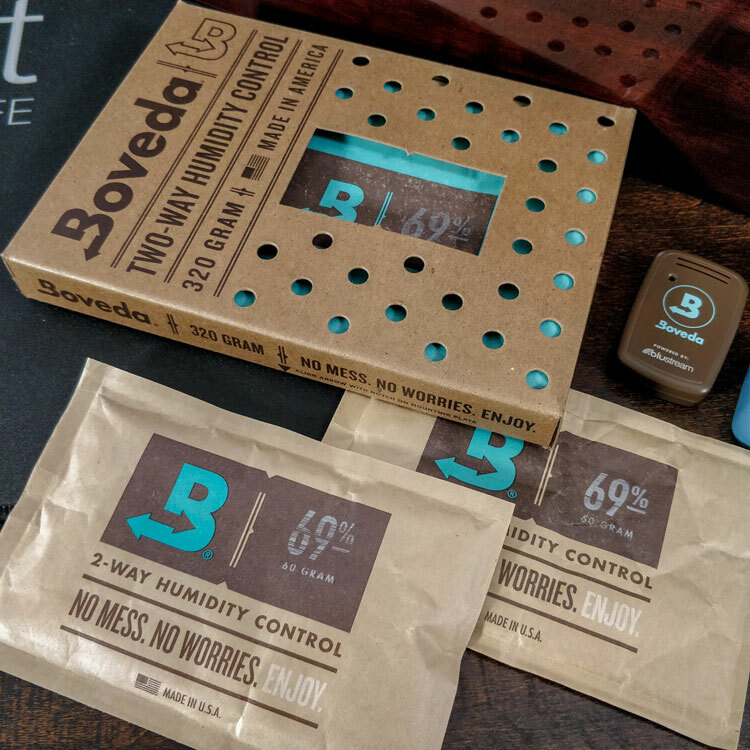 However, we quickly replaced the supplied devices with Boveda packs and a digital hygrometer. Acrylic humidors are a convenient alternative to wooden ones as they very low-maintenance. No seasoning is required and you can rely on a strong, airtight seal. 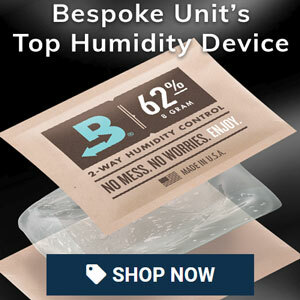 Out of the ones that we tried, Boveda’s acrylic humidors offer the best performance and value for money. 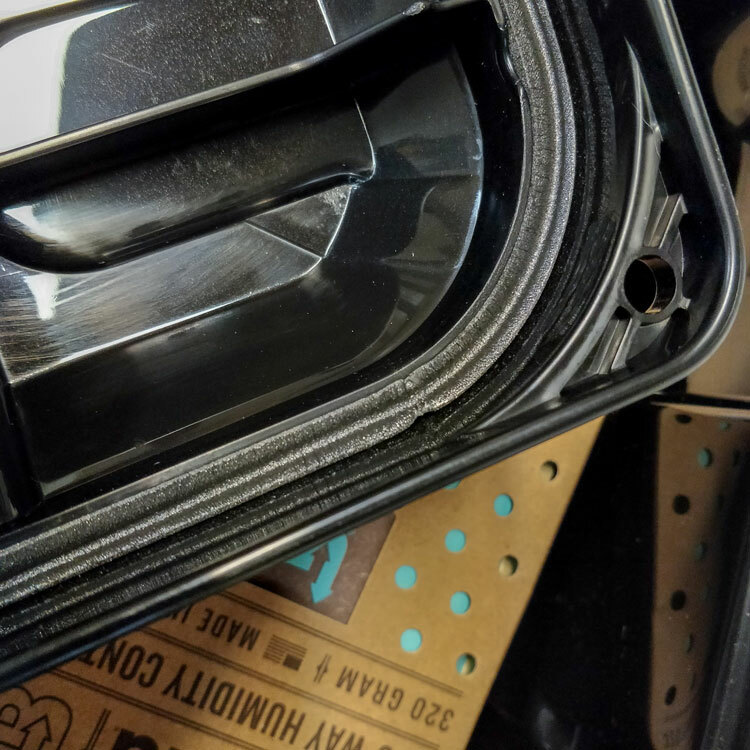 The airtight seal is enforced by magnets and there’s a grated removable tray for conveniently storing your humidity packs. As well as the Old Glory above, we’ve relied on the Habanos & Hermanos Classic Collection humidor for a number of years. We were first drawn to this model thanks to the elegant black ebony and maple finish on a reasonable budget. However, we were impressed by its performance too! Like the Old Glory, however, we ditched the original humidifier in favour of a Boveda mounting plate to store a 320g pack. The decorative analogue hygrometer isn’t very reliable either so we installed a Boveda Butler to periodically check on the moisture levels. Among the more premium options, we were quite fond of Daniel Marshall’s Signature Burl humidor. Handmade in Santa Ana, CA from black ebony, the lid is lined with a magnetic veneer so you can easily remove and replace your devices. 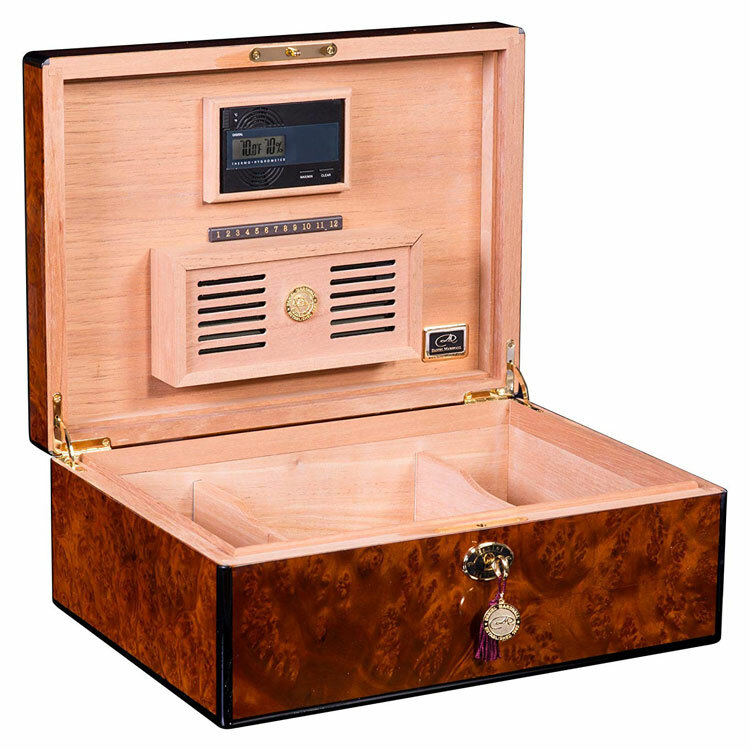 Furthermore, this humidor is supplied with a digital hygrometer and proprietary humidifier, which are both quite reliable. 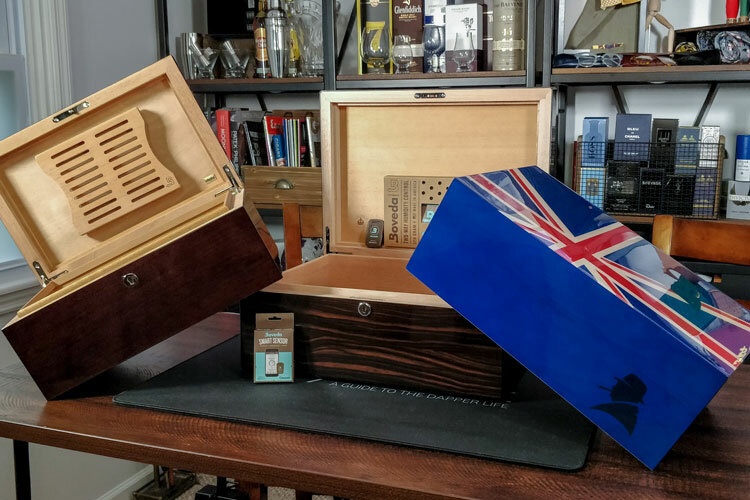 Handcrafted by Amish craftsmen in Rhode Island, the American Chest Company is owned by David “Mac” McLoughlin with the goal of relaunching US-made humidors. Each chest is crafted only from hardwood and the lids also feature a magnetic lining for easy replacement of your devices. We tried a number of different coolers, each with varying degrees of success. While we also liked the NewAir 100H, the Whynter CHC-122BD is an excellent choice for those with certain space restrictions. This small cooler features a crisp LCD display for temperature control and runs silently throughout the day. Our only comment was that the use of an analogue hygrometer seemed somewhat anachronistic and not the most reliable choice. Therefore, be sure to equip it with a properly calibrated digital hygrometer too. Rather than a typically imposing glass-faced cabinet, our favourite was actually this convenient yet elegant end table. As it can be discreetly placed in a room like typical furniture, it’s very practical. 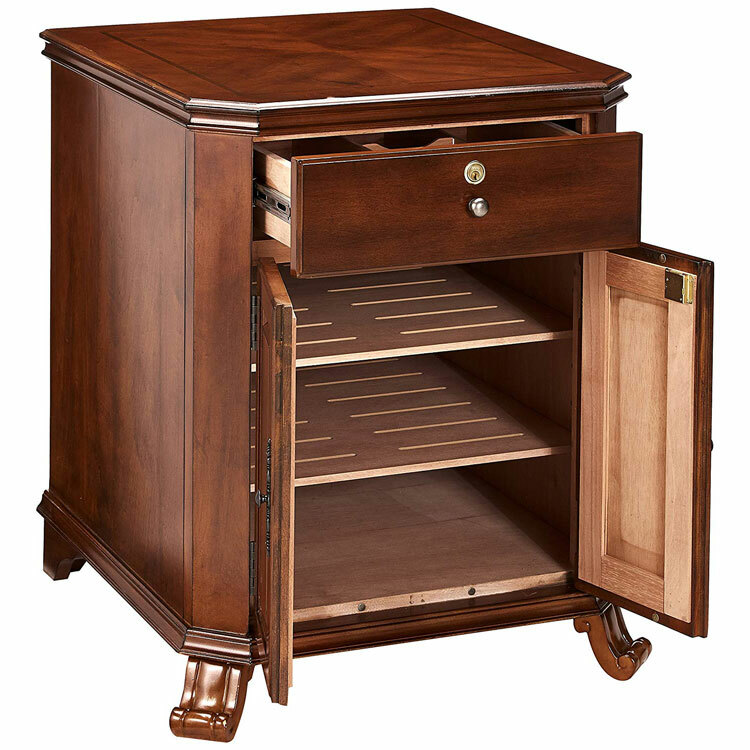 In fact, you could even place a desktop humidor on top for extra storage! Furthermore, the Montegue is equipped with two interior A/C outlets for powering any electronic devices. One of the most prestigious and exquisite humidors that we’ve ever tested, the Churchill “Statesman” series is an exclusivity by Davidoff. They’re hard to find as they’re handmade in small quantities in a French Living Heritage Company (Entreprise du Patrimoine Vivant) workshop. However, if you have the means and spot one, be sure to grab it as it’s certainly a rarity. Our first choice for building a coolidor would be the Iris USA Remington. Made with BPA-free plastic, it’s also built with an integrate gasket, which offers an excellent seal. Thanks to its large size and stackable construction, it’s our first choice for bulk storage. Check out our coolidor guide to learn how to convert this for cigar storage. 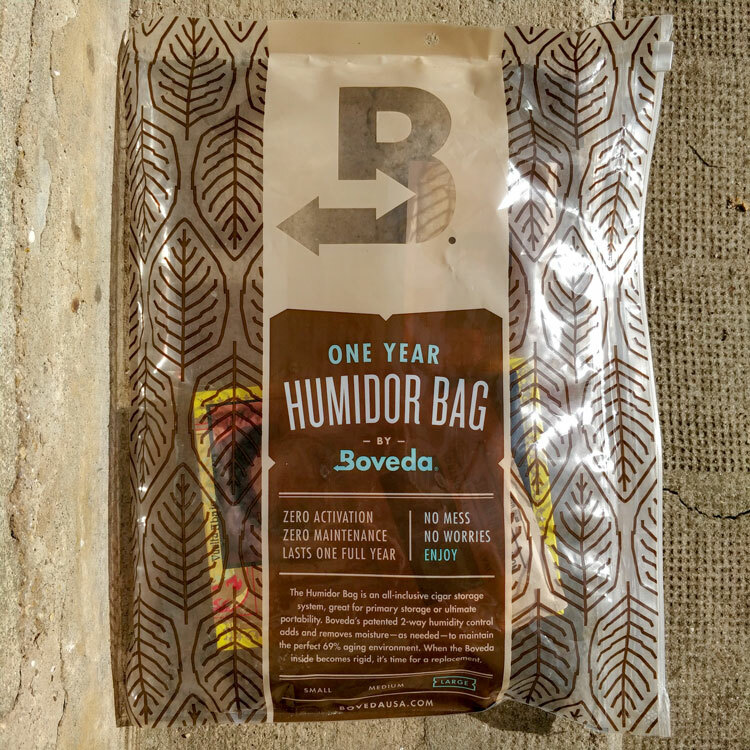 If you need some quick, convenient and affordable cigar storage, we can’t rate Boveda’s One-Year bags highly enough. Unlike zip-lock bags, they are barrier laminated for a total reduction of moisture exchange. The enclosure is also specifically designed for an airtight seal so you can be confident that your cigars will be in an optimal environment. These are great for travelling too and we like to use the large models for storing entire boxes when on the move. 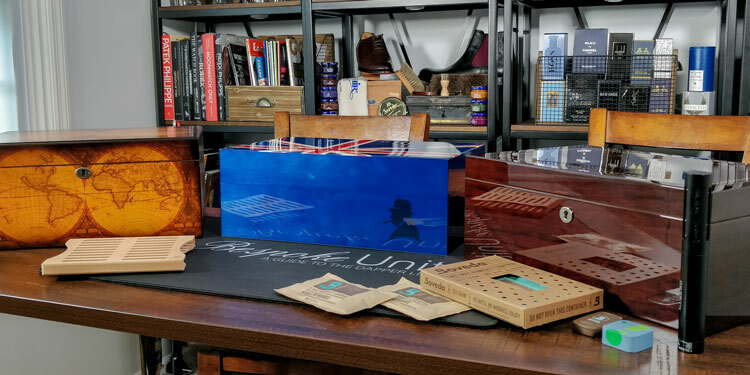 How Did We Rank These Humidors? The above list isn’t just randomly-assorted clutter of random cigar storage solutions. 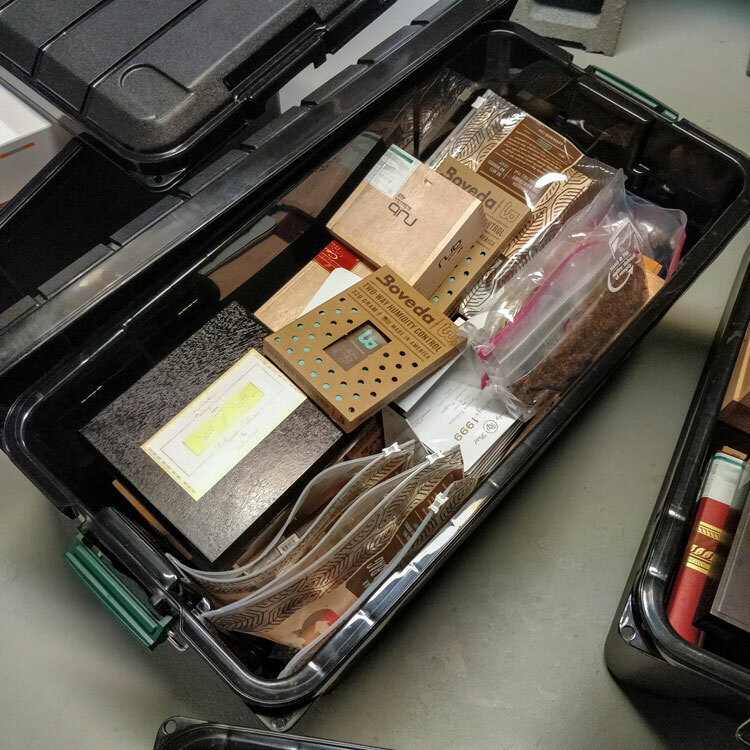 In fact, as serious cigar enthusiasts, we used our years of storage experience to test a variety of different containers. Below you’ll learn a few of the considerations we applied when reviewing the humidors. We find that the seal quality of a humidor is generally the most fundamental quality. 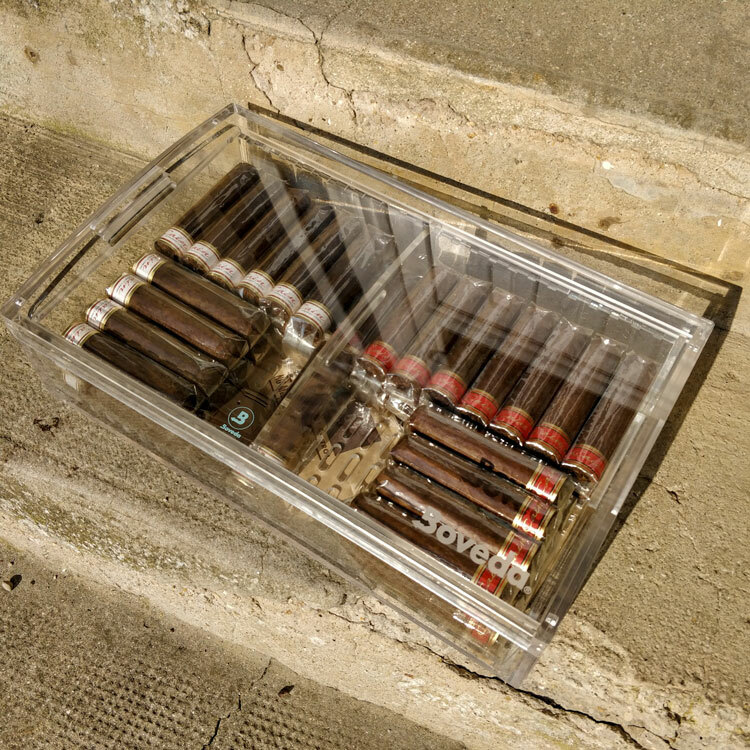 An airtight seal can render a humidor reliable. Meanwhile, a poor one will be its greatest failing. If your storage doesn’t provide a strong, airtight seal, you will lose a significant amount of moisture through the air gaps. Such issues can lead to a dry environment for your cigars, which may end up ruining your collection. We tested this through a number of ways. With tupperdors and coolidors, we were able to fill them with water and see whether there were any leaks when they were tipped on their sides. As for the more classic variety of humidors, we would simply keep track of their relative humidity levels with a calibrated humidor. Over the course of a few weeks, we would check for any fluctuations in humidity to see whether there were any changes. The quality of materials used for the humidor were taken into consideration. However, we remained mindful of the price point too. 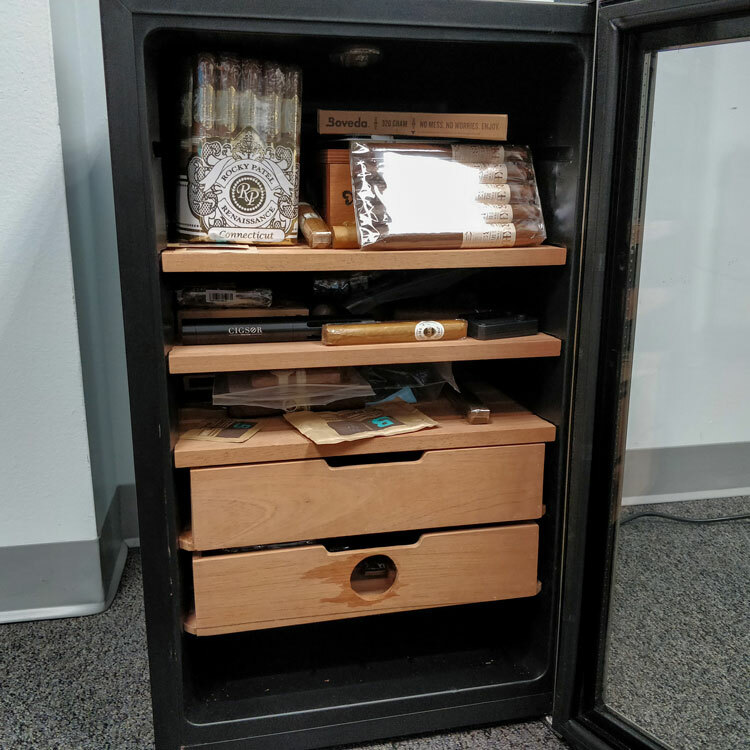 While premium humidors used precious materials, more affordable storage solutions would naturally be constructed from proportionately cheaper substances. We were actually surprised by how some pricier humidors would use cheap manufactured wood in some areas, which caused moisture exchange. Meanwhile some cheaper ones would only feature Spanish cedar veneers rather than hardwood. Nevertheless, this was to be expected at certain price points. As for tupperdors, we ensured that we only reviewed those made from BPA-free plastics and were generally free of any toxins. The materials used is often closely related to the overall build quality. However, there were times that we were shocked by some shoddy construction and poor finishes. Therefore, we made sure to keep a close eye on this too. This included characteristics such as the hinges, which must be relatively strong since they often support a heavy lid. However, it also took into account joints, lining, finishes as well as the feet and any handles for carrying. As you’ll learn in our various guides, there are many different types of cigar storage options for just about every budget. Nevertheless, we still sought to analyse their value for money with regards to their price point and the eventual return on your investment. 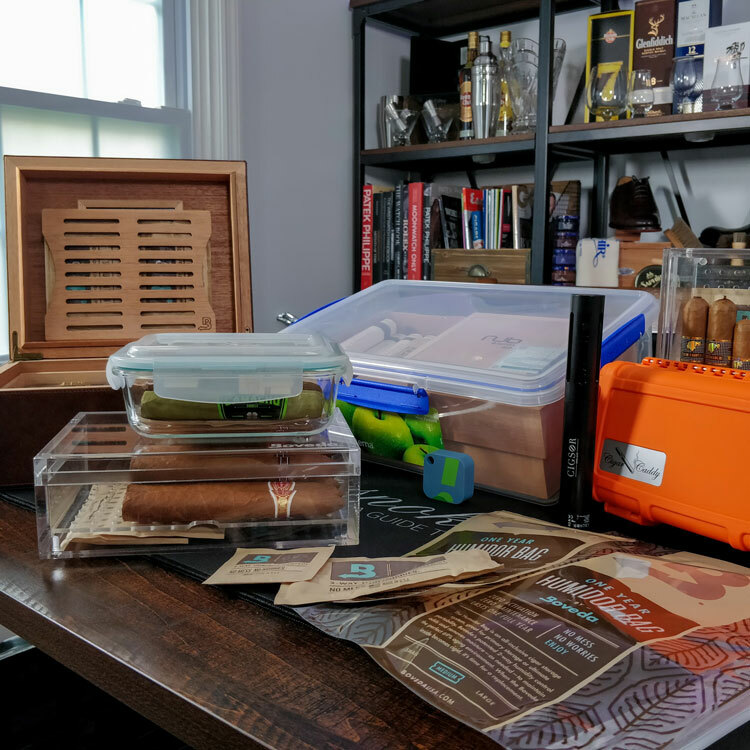 Although we didn’t expect much from cheaper humidors, we were at times blown away by their build quality and materials. Yet, sometimes we were unable to find any particular added benefits of more expensive models in comparison. Although not all humidors are designed with thermal insulation in mind, we did include this as a factor during our tests. Not only are cigars very sensitive to temperature fluctuations, but heat as a molecular impact on humidity. 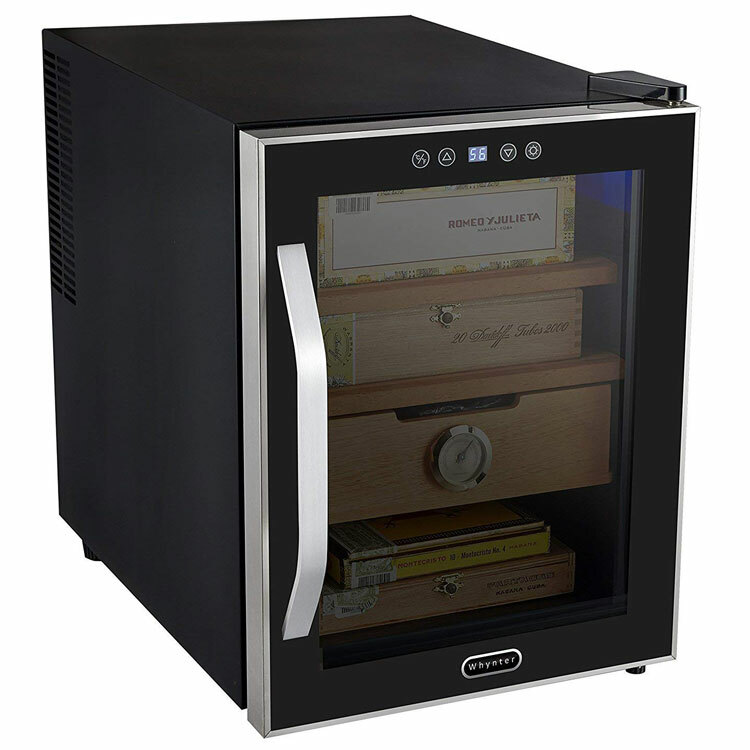 Therefore, a poorly-insulated humidor may experience changes in humidity as the contents warm up or cool down. As such, it’s an important consideration to take into account. We were relatively lenient on humidor types that weren’t built for this in mind. However, we were very mindful of this when checking out cigar coolers. Often overlooked during manufacturing or when assessing their quality, we were always very mindful of the equipment supplied with the humidors. The humidifier and hygrometer used in a hygrometer is of vital importance and we were more disappointed than we’d like to admit with most default devices. For instance, we often found that the majority of humidors were supplied with floral foam-style humidifiers and analogue hygrometers. While we would generally forgive this with cheaper humidors, it wasn’t a good sign when they were supplied with premium ones. Most of the time, we would just switch these out with a digital hygrometer and the appropriate Boveda humidity packs. However, this wasn’t always a simple affair and would sometimes need a little elbow grease. 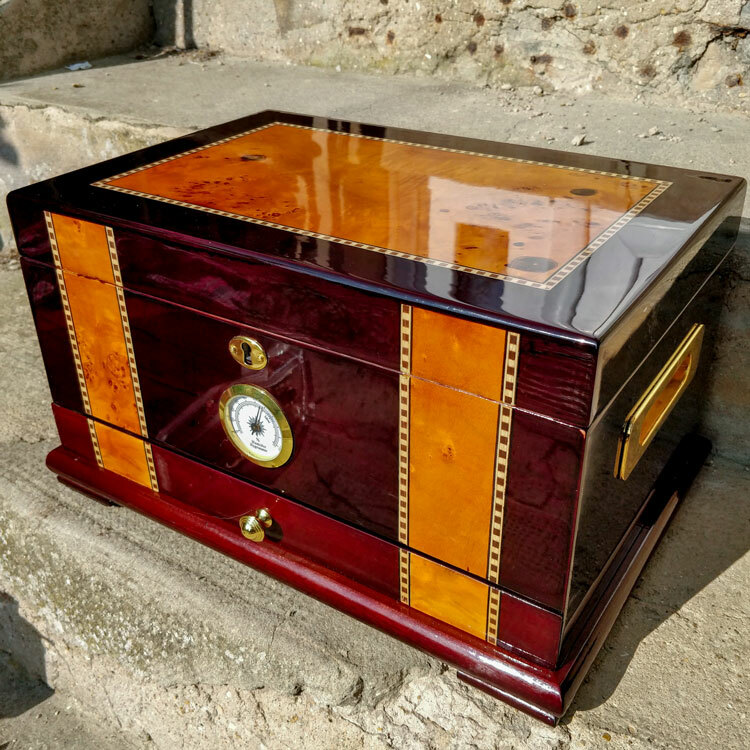 While coolidors and tupperdors aren’t going to win any beauty contests, we felt that it was still worth considering aesthetics with wooden humidors. Given that they’re often designed to be both decorative and functional, we would often keep this in mind. After all, there’s not much point to even the most reliable desktop humidor when it isn’t pleasing to the eye! Nevertheless, it was often an afterthought rather than an important factor. To help you in your search for the best humidor that’s most adapted to your needs, we’ve created a series of guides. 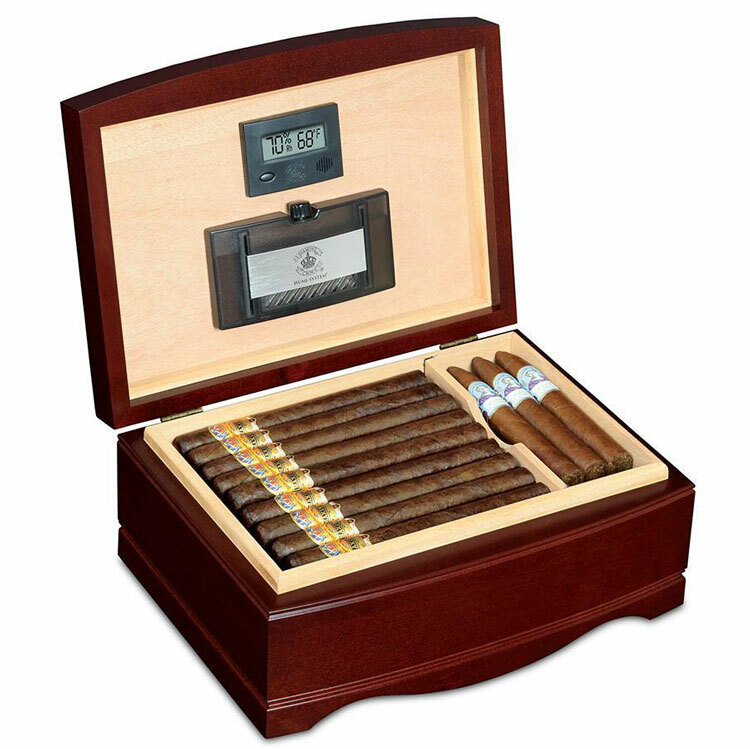 Each one rates humidors according to certain parameters so you can find the perfect humidor. Currently, our best humidor pages are based on budget and size. Meanwhile, if you’re looking for a specific type of humidor, we also offer guides based on this too. As the heading suggest, this series of humidor guides focuses primarily on humidor sizes. 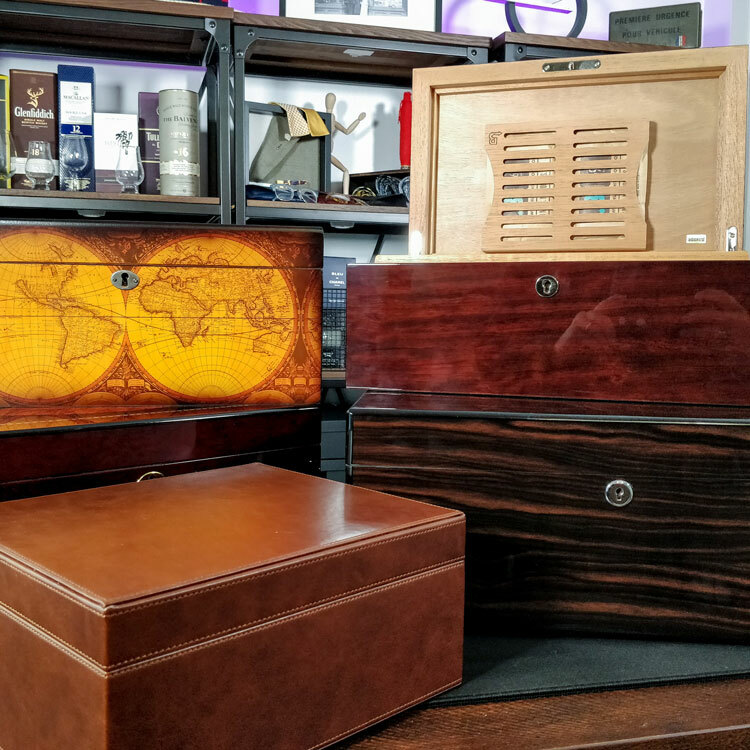 While most people often think of wooden desktop constructions when thinking of humidors, the following guides include a variety of different configurations. 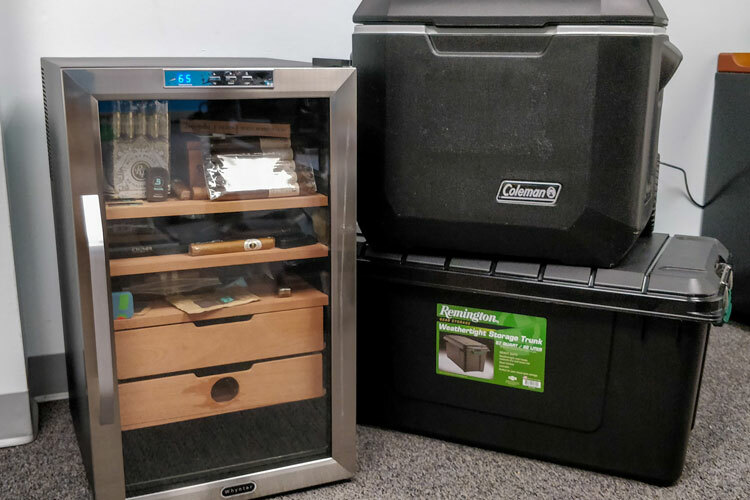 Whether you prefer a more mobile storage solution or you’re just an occasional cigar smoker, small humidors are best suited to small collections. In this guide, you’ll learn about the best humidors that can store fewer than 50 cigars. Head to the best small humidors guide to learn more. For the typical cigar smoker, a medium-sized humidor tends to be sufficient. This guide will provide an overview of the best humidors with capacities that range from 50 all the way to 250 cigars. While this may seem like a pretty wide range, you’d be surprised how quickly you can arrive at 250 cigars! Discover our recommendations by navigating to the best medium humidors guide. 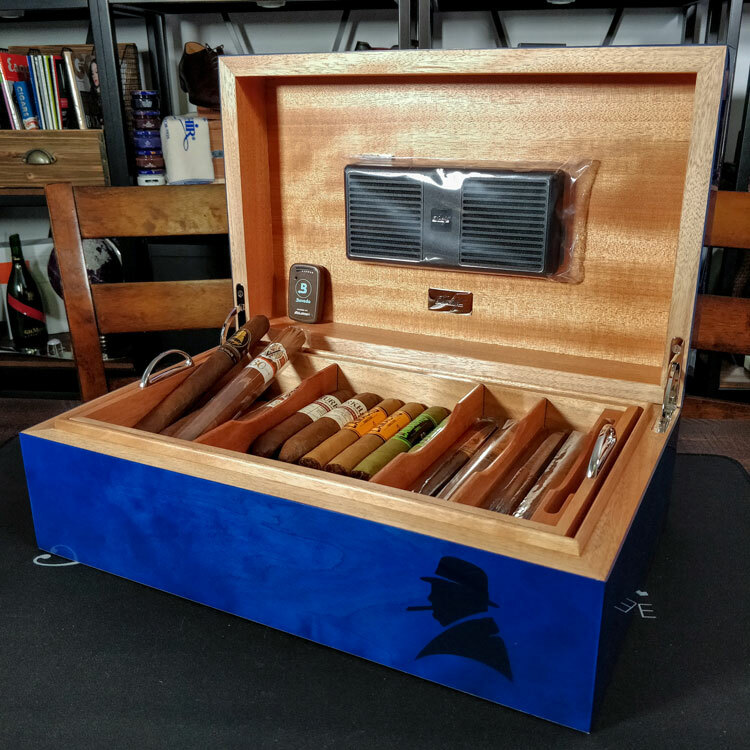 While some serious collectors prefer to use a range of various different humidors, you may want to consolidate your collection into a single humidor. This guide features humidors that store as few as 300 cigars all the way to cabinets and vaults for several thousand! See the best ones by heading straight to the best large humidors guide. This series of guides focuses on the typical budgets that prospecting buyers may have in mind when looking for a humidor. While we generally try to remain strict on the budgets we’ve outlined, we’ve also taken cigar count into consideration. While we would usually recommend better quality humidors, the budget isn’t always there. Whether it’s for a little extra space or mass storage, this particular guide focuses on humidors that will set you back less than $50. Furthermore, there are some exceptions to cheap equating low quality, which you’ll discover in this guide. Head to the best cheap humidors guide to see the selection. The bulk of our preferred humidors will likely find themselves here. The budgets here tend to vary between $50 and $500 while gravitating somewhere near the $300 price point. Indeed, this is a wide range but these humidors offer the best value for money according to their configuration, quality and design. Check them out by going to the best value humidors guide. If money is not object or you want to treat yourself with the best quality humidors on the market, this is the place to look. This guide features the best humidors with prices starting at $500-odd. While there are also some humidors that are cheaper than that, take note of their capacity compared to the others featured in the list. Take a look now and head to the best Luxury humidors guide. Reviewed by Tommy S., on 29th October . "Great overview with a wide range of options. Some fantastic humidors in this guide. I wish that I could buy them all!"